145315 Pentair Sand Dollar Top Mount Sand SD35 In Ground Pool Filter. 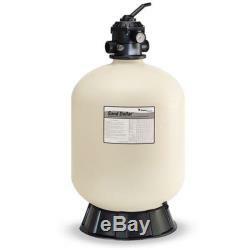 The Sand Dollar filter is the perfect high performance sand filter. It's incredibly simple to operate and maintain, and it's built with long-term reliability in mind. Plus, its highly efficient design provides all the clean, crystal clear water your pool requires year after year. Pool water is routed through the sand-filled pressure vessel. The sand traps particles so small they are undetectable to the eye. Over time, dirt accumulates in the spaces between the sand particles, causing the pressure in the vessel to rise. This signals you to "backwash" the filter. Simply reverse the water flow and "knock out" the dirt. All Pentair sand filters feature a special internal design that keeps the sand bed level and ensures even water flow. That results in the most efficient filtration possible. Pool filter operation doesn't come any easier. The multi-port valve of the Sand Dollar filter puts all filter functions right at your fingertips - just rotate the handle to the desired position and Sand Dollar does the rest for sure and simple operation. Warning: Chemicals or materials known to the state of California to cause cancer, or birth defects or other reproductive harm may be present in this product. One-piece thermoplastic tank for exceptional strength, corrosion resistance, and long life. Combination water and sand drain makes servicing and winterizing fast and easy. Special internal design keeps sand bed level for consistent performance and extended time between cleaning cycles. Attractive almond color blends with any outdoor decor. Top Mount 6-function 1-1/2 multi-port valve features a pressure gauge and manual air relief for optimum filtration efficiency. Internal design ensures that water is exposed to maximum sand surface area for superior filtration performance and efficient backwashing. Requires 100 lbs of sand. Sand Filters capture dirt and debris in the tiny gaps between sand particles. As the space between the particles fills up, water pressure builds. Cleaning the filter is as easy as switching the water flow and backwashing the debris safely out of the pool and filter. Sand should be replaced every 5-8 years. Save time and energy by using a Sand Filter! Sand filters require only basic backwashing maintenance to keep them running well, leaving you more time to sit back and enjoy your clean pool. Trusted by Pool and Spa Owners Since 2006. PoolSupplyWorld has been serving customers as a pool and spa resource since 2006. We believe that prompt, courteous communication is one of our best qualities, and we're always looking for new ways to make shopping with us an easier, more convenient experience. Customer Service - You can reach us in one of three ways. We have relationships with the most popular manufacturers in the industry. We carry over 50,000 products. More than a Pool Store! We want to help you. We value building long term relationships. We want you to count on us. The item "145315 Pentair Sand Dollar Top Mount Sand SD35 In Ground Pool Filter" is in sale since Friday, June 16, 2017. This item is in the category "Home & Garden\Yard, Garden & Outdoor Living\Pools & Spas\Pool Equipment & Parts\Pool Filters". The seller is "poolsupplyworld" and is located in Dallas, Texas. This item can be shipped to United States.